NASHVILLE, Tenn. -- A small town warehouse supervisor turned in one of three tickets splitting the world-record $1.6 billion Powerball jackpot, and swiftly announced that he would take his money now, giving up hundreds of millions of dollars in the future. John Robinson said he reached out to his brother for help assembling a team of lawyers and financial planners before deciding to take the winnings in a single lump sum of nearly $328 million, rather than let the Lottery invest the prize and pay him 30 annual installments totaling an estimated $533 million. Why pass up on a certain income totaling more than $200 million? "We're going to take the lump sum, because we're not guaranteed tomorrow," Robinson said. "We just wanted a little big piece of the pie. Now we're real grateful we got the big piece of the pie." They have no plans to move from their small, grey, one-story house in Munford, a town of about 6,000 north of Memphis. Why not move into a luxurious compound somewhere? "I've never wanted that in the past. I don't really want that now," said Lisa Robinson, who works in a dermatologist's office. "Big houses are nice," her husband said. "But also you gotta clean 'em." They'll pay off their mortgage and their daughter's student loans, but don't plan any big purchases. Both plan to return to work on Monday. "That's what we've done all our lives, is work," John Robinson said. "You just can't sit down and lay down and not do nothing anymore. How long are you going to last?" 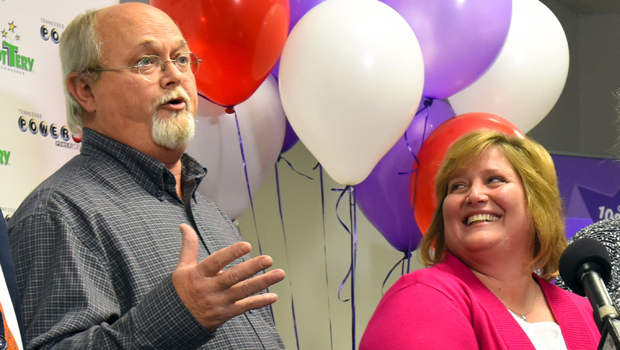 Tennessee Lottery executive Rebecca Hargrove said the couple would get a "small check today for a few million," and collect the full lump sum in about 10 business days. CBS News' David Begnaud reported that Dana Naifeh's grocery store sold the state's winning ticket. On Thursday morning, surveillance cameras captured the head of the Tennessee Lottery walking in with the billion dollar news and a $25,000 bonus for the store, which is named Naifeh's. John Robinson said earlier Friday that they would help certain friends, give to the St. Jude Children's Research Hospital in Memphis, and donate to their church. "I'm a firm believer in tithing to my church," Robinson said in an appearance on NBC's "Today" show. Their daughter Tiffany, who flew with them to New York and back, said she also wants a horse. "My first thought was, I've always wanted a horse," she said. "I get a horse now. My dad always said, 'When I win the lottery.'" John Robinson carried the precious slip of paper to New York City and back before showing up at Tennessee's lottery headquarters. Their lawyer went with them, as did their rescue dog, Abby, who snoozed through most of the excitement. The other tickets were sold in Melbourne Beach, Florida, and Chino Hills, California, each one overcoming odds of 1 in 292.2 million to land on all the numbers. Lottery officials in those states have yet to confirm or identify the winners. News of a possible winner in California was quickly deflated Friday when that feel-good tale was described as a prank. Lawyers who have represented other lottery winners advise against going public until they are ready to manage such a huge windfall. Talking seriously with experts in tax law, financial planning, privacy, security and other safeguards can help keep them, and their winnings, safe, they say. The Robinsons seemed aware of at least some of the risks, even as they told the world that they were sudden multi-millionaires. Their neighbor Mary Sue Smith, told The Associated Press that Lisa Robinson asked her Friday morning to put "No Trespassing" signs on their lawn. "Who will be coming out of the woodwork?" said Mary Sue Smith. "Everybody you knew in high school and elementary ... You know what happens." The couple's son, Adam, is an electrician, and their daughter, Tiffany, lives nearby after graduating from college recently. Mary Sue's husband, Roy Smith, called them "fine people," dependable and hard-working. "It could not have happened to better people," Roy Smith said. "He's a civic-minded person, and he probably will remember the town." Munford's mayor, Dwayne Cole, had wished openly Thursday for an investment in the town, whose annual budget is $3.67 million. He said Munford's needs include fire department equipment, an indoor athletic facility for local schools and a community gymnasium. On Friday, Cole told the AP that they are not the kind to squander their money. "They're small town people who appreciate community, appreciate family values. They appreciate hard work. They are responsible. They've always lived within their means," said Cole, who owns an auto parts store in town. "They have to understand, though, this is a big deal. This is not just a big deal for Munford. This is a big deal nationwide and worldwide. They understand that, I think. I hope they do," Cole added. "I believe they can deal with it. It may be totally overwhelming." Robinson said he bought the winning ticket at his wife's request at Naifeh's on his way home from work Wednesday night, even though he wasn't feeling well. His wife stayed up to watch the drawing, carefully writing down the numbers. Then she started "hollering and screaming through the hallway saying, 'You need to check these numbers. You need to check these numbers,'" Robinson said. He did, four times, then thought: "Well, I'll believe it when the news comes in on the morning."